This Caribbean island hopping holiday allows visitors to discover the natural beauty of Grenada, relax on the small and charming island of Bequia in the Grenadines, then experience the Platinum west coast of Barbados. 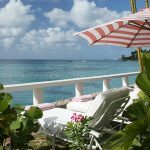 – 5 nights at Cobblers Cove Hotel in Barbados. 15 nights from £3695 per person including all flights, transfers and bed and breakfast. Sample price is for travel in low season, staying in the lowest room type and include current special offers. Start your holiday by flying into Grenada, where you stay at Calabash Luxury Boutique Hotel & Spa. The five star hotel is set within tropical gardens beside L’Anse Aux Epines beach and offers accommodation in spacious suites. A typical day at the resort begins with an a la carte breakfast served on your suite’s private balcony, followed by a morning spent in the recently updated pool area and an informal lunch at Bash Beach Café. In the afternoon, guests can take advantage of the varied water sports on offer on the beach, or visit the spa where a variety of treatments are available. Rhodes Restaurant is a fine dining venue which is overseen by Gary Rhodes, serving elegant dishes with a Caribbean twist. Outside the resort, excursions allow visitors to discover Grenada’s varied landscape including mountains, rainforests, rivers, waterfalls and of course the famous Grand Anse beach. The underwater sculpture park is perfect for snorkelers and scuba divers while more cultural activities include visits to the Rivers Antoine Rum Distillery and the Belmont Estate chocolate plantation. Find out more about things to do in Grenada. After spending five nights at Calabash Luxury Boutique Hotel & Spa, take a short flight to St Lucia then onwards to Bequia, the northernmost island in the Grenadines just a few miles south of St Vincent. 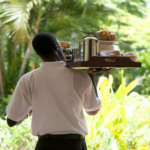 Here you will stay at Bequia Beach Hotel, a colonial style property that combines luxury, elegance and charm. The hotel boasts a relaxing, friendly atmosphere coupled with a first class restaurant, beautiful infinity pool, secluded sandy beach and far reaching sea views. Guests at the hotel can spend their days relaxing by the pool or on the beach, where they will also find water sports including paddle boarding and wind surfing. 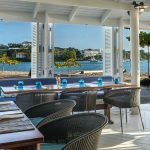 The hillside restaurant serves Italian dishes in a romantic setting, while Bagatelle’s beachside veranda is the perfect spot to enjoy a fusion of Caribbean and international cuisine. Bequia itself is a very special destination – small enough to feel charming and authentic yet large enough for guests to be able to get out and about. 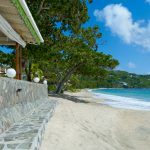 There is an excellent choice of local restaurants on the island as well as a selection of peaceful beaches, while yacht charters and boat excursions allow visitors to explore Mustique and the Tobago Cays. 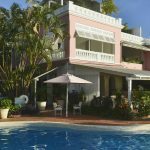 Spend five nights at Bequia Beach Hotel then take a short flight to Barbados and continue by car to Cobblers Cove Hotel, located on the north west coast. 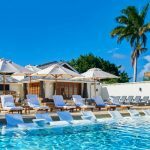 Cobblers Cove is a family owned hotel which combines the charm of an English country house with the style and character that is typical of Barbados. The Relais & Chateaux property is set beside a white sand beach, with suites boasting views over the tropical gardens or out to sea from their private terrace. A highlight of the hotel is the Camelot Restaurant which renowned as one of the best restaurant in Barbados, serving freshly caught fish and local ingredients alongside an impressive wine list. There is an excellent range of complimentary activities on offer including sailing, snorkelling, water skiing and tennis. Barbados is known for its stunning coastline with soft sand and turquoise waters, but there is plenty to do away from the beach. Getting out and about is easy and well worthwhile – local buses cost just $1, allowing visitors to easily discover local towns and restaurants in different areas. Guests staying at Cobblers Cove can easily wander along to Speightstown, while Holetown and Bridgetown are both within 30 minutes’ drive. There are many excellent golf courses across the island as well as other places of interest including rum distilleries, botanical gardens, historic mansions and military buildings. The rugged east coast of the island provides a contrast to the more popular west coast, home to rugged surf beaches and a scattering of local villages. Find out more about things to do in Barbados. After five nights at Cobblers Cove Hotel, end your island hopping holiday by flying back to the UK from Barbados. Flights with British Airways in Economy from London Gatwick to Grenada and from Barbados to London Gatwick. Inter-island flights with a local airline from Grenada to Bequia and from Bequia to Barbados. 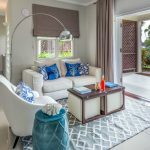 5 nights’ bed and breakfast at Calabash Luxury Boutique Hotel & Spa sharing a Junior Suite. 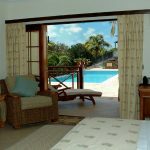 5 nights’ bed and breakfast at Bequia Beach Hotel sharing a Classic Pool & Sea View Room. 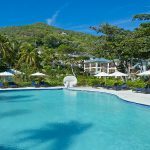 5 nights’ bed and breakfast at Cobblers Cove Hotel sharing a Garden Suite.